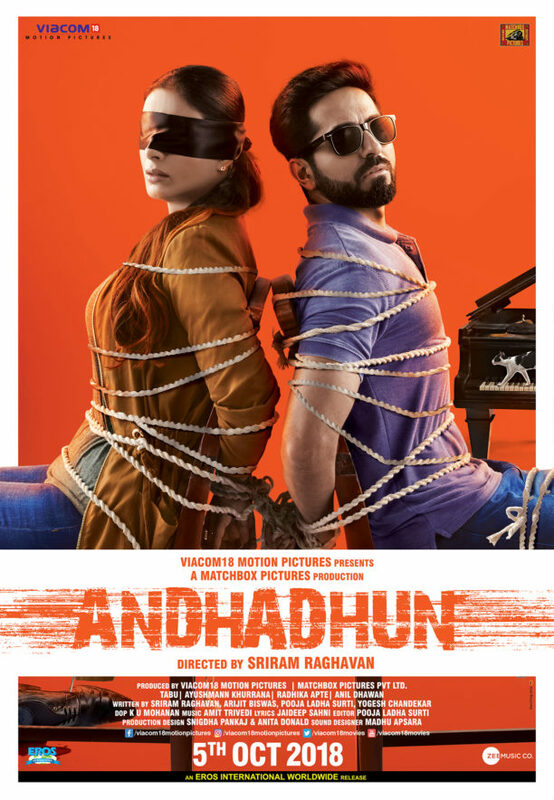 Directed by Sriram Raghavan, the thriller, Andhadhun, starring Ayushmann Khurrana, Tabu, Radhika Apte is set to release on 5th October 2018 in cinemas worldwide. The film is a tale of a blind pianist, a woman blinded by desire and apparently a crime they never say coming. Here is the official synopsis: When you are blind, the world talks to you in a dozen different ways, and if you listen, there is music in everything. AKASH, a blind pianist in Pune, is hopelessly stuck trying to compose his own tunes. A chance encounter introduces him to Sophie, a free spirited girl whose father owns a piano bar. Akash starts performing at the bar, his tunes flowing fast and true, thanks to his new muse, Sophie. Retired Bollywood star Pramod Sinha is impressed by Akash and invites him to a private concert at his condo. Lady luck is finally smiling on Akash. We also have some of the cool songs from the soundtrack! There is much more to come including a cool interview we have with Ayushmann about the film so watch this space for more! 16 queries in 0.590 seconds.